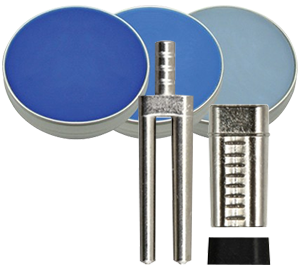 The Schick G2 brings a higher level of accuracy to sectioning dies. It performs the cutting from below the model for clean and precise saw cuts that do not damage the preparation. The G2 is built using the latest technology. Thanks to its intelligent design, it is safe and simple to use. Using the rear port, the G2 can be connected to nearly any suction apparatus. Dust and debris are evacuated during the cutting process, leaving the work area clean and the models ready for further preparation. The laser allows precise sectioning of the model to be carried out quickly and safely. The line marking laser clearly shows where the cuts will be made and where the user should avoid positioning their hands. Contact must be made with the special touch sensors in order to operate the unit and to promote a safe working position. As a result, unintentional start-ups are avoided, further ensuring the safety of the user. Diamonds … a technician's best friend. A custom 85 mm diameter blade is positioned below the model. For quick cutting and a long life span, the G2 blade is specially coated with diamonds. With a thickness of only 0.3 mm, equal to the standard 0.010” handsaw style blade, the G2 cutting blade allows sectioning in even the most delicate areas. Light pressure on the model lowers the saw table, starting the blade movement and permitting it to penetrate into the gypsum. To avoid unwanted movement of the model, the saw table is coated with a rubberized material that provides a solid grip on both pinned and unpinned models. To promote a safe and comfortable working position, the G2 has hand guards underneath the saw table that offer protection against debris, as well as the rotating saw blade.